ParisSharing, the only community-driven alternative accommodation service based in Paris, today announced the launch of its enhanced local services for guests. ParisSharing facilitates vacation rentals directly between Paris homeowners and guest travelers in a trusted social environment, with a local Parisian touch. Accommodations featured on http://www.paris-sharing.com are what savvy travelers look for in a cost-effective alternative to pricey, impersonal Parisian hotels. ParisSharing is not just a short-term vacation rental platform, but a provider of added-value local guest services for travelers. The guest services include helpful owner-sourced recommendations to assist guests plan their trip and enable travelers to experience Paris like a local. Once in Paris, ParisSharing offers personal “greeting services” to meet guests at their accommodation and help them check-in and out of their Paris home. In addition, services such as airport pickup, babysitting services, concierge services, tour guides, in-home chef and more are also offered through ParisSharing. “We’re providing a service for a growing segment of travelers that we refer to as ‘cultural creatives', people looking for a truly local experience, who value human connections, and who want to work with organizations that share those same values,” said Carsten Sprotte, founder of ParisSharing. International travelers alleviate risks when using ParisSharing for their short-term vacation accommodation. Unlike many other peer-to-peer rental Web sites and agencies, ParisSharing is fully compliant with strict French laws governing escrow services, licensing and financial guarantees. Additionally, ParisSharing has established its own Charter of Guarantees for both guests and homeowners. “Our community-based system brings homeowners and guests closer together, providing an atmosphere of trust and confidence. Plus, our integrated safeguards provide our travelers with contingencies in the unlikely case of dispute, making ParisSharing the most secure short-term vacation rental experience possible,” said Sprotte. Paris-Sharing.com provides travelers one easy-to-use, secure site to find and book all types of alternative accommodations, including primary-home short-term rentals, vacation rentals, home exchanges, and Bed & Breakfasts. To make the process as seamless and simple as possible, ParisSharing acts as a financial intermediary handling all payments (by credit card, Paypal or wire transfer) and security deposit authorizations. The community atmosphere promotes interaction between owners and travelers, and features authentic guest reviews and helpful community-sourced local content. “Whether our customers are looking for a first-class or an economy stay, we offer them a unique Paris experience that they will remember fondly. At the same time, we make their booking and payment process as simple and carefree as a hotel.” said Sprotte. Founded in 2010, ParisSharing is the only peer-to-peer alternative accommodation Web site specializing exclusively in Parisian properties. 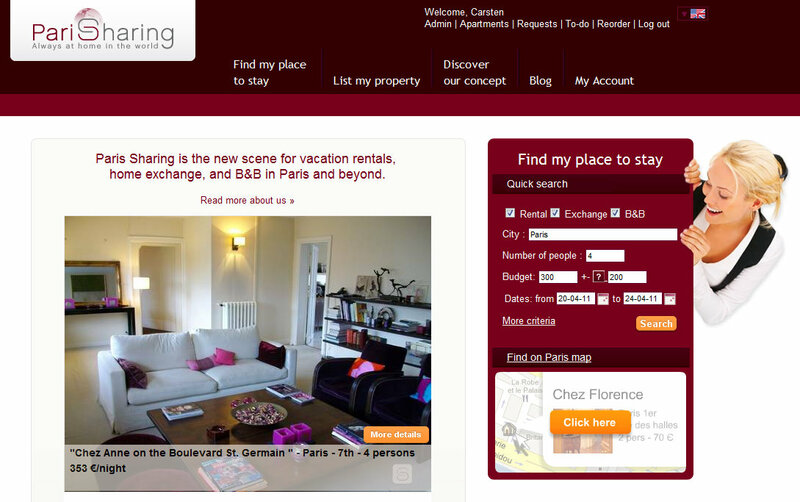 http://www.paris-sharing.com provides a secure trusted community environment, for listing, searching and renting three main accommodation options: short-term holiday rental of primary or secondary homes, home exchange, and Bed & Breakfast. ParisSharing also focuses on offering truly local services to help vacationers experience Paris like a Parisian. Properties range from a small apartment near the Père Lachaise cemetery to a vast loft with a rooftop garden in the high-end 7th arrondissement, ParisSharing caters to all budgets and styles. ParisSharing always at home in Paris ParisSharing the only peer-to-peer alternative accommodation Web site specializing exclusively in Parisian properties.